One of the first principles to understand when you are learning about electricity is the distinction between a parallel circuit and a series circuit. Both types of circuits power multiple devices by the use of an electrical current flowing through wires, but that's where the likeness ends. To understand the distinctions between a circuit where the devices are wired in series from one where they are wired in parallel, you must first understand the basics of an electrical circuit. In simple terms, all circuits work by providing a closed loop of wires through which electrical current can flow. As electrons flow through the wire loop from the source (hot wires) and back to the source (neutral wires) the current flow can power lights or other devices that are installed within the loop. Any interruption in the pathway (such as a switch being opened) interrupts the pathway and stops to flow of electrical current. In a series circuit, the devices along the circuit loop are connected in a continuous row, so that if one fails or is disconnected, the entire circuit is interrupted. This will cause all devices along the circuit to stop working. 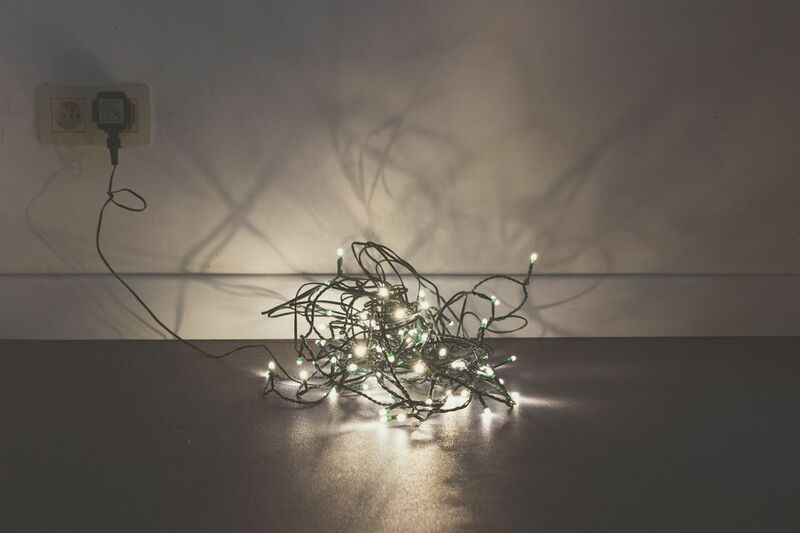 Series circuits are somewhat rare in-house wiring, but they are sometimes used in strings of Christmas lights or landscape luminaries, where one light bulb failing will cause the entire string to go dark. Much more common than series circuits are those wired in parallel—including nearly all of the standard circuits in your home powering light fixtures, outlets, and appliances. Here, the wiring is configured in such a way that there is a continuous pathway to all the devices along the circuit; individual devices merely "tap into" the main circuit loop. Parallel circuits split the current flow into multiple paths, so that a single failure does not shut down the entire circuit. Most standard 120-volt household circuits in your home are (or should be) parallel circuits. Outlet receptacles, switches, and light fixtures are wired in such a way that the hot and neutral wires maintain a continuous pathway that the various devices can tap into without interrupting the circuit in the event that one fails. Sometimes this continuous pathway is creating by "pigtailing" into the circuit wires in order to power an outlet or light fixture. Other times, the configuration of the device itself creates the continuous ongoing pathway. A standard outlet receptacle, for example, has a metal strip (connecting tab) between the pairs of screw terminals that assures that the pathway to the next outlet is maintained when the circuit wires are connected to it. If the receptacle goes bad, the connecting tab on the device assures that the circuit pathway continues to the next outlet. One household example where series wiring is useful in when a single GFCI (ground-fault circuit interrupter) receptacle is used to protect other standard receptacles located "downstream" of the GFCI. As you may know, a GFCI receptacle has screw terminals labeled "line," as well as screw terminals labeled "load." The load terminals can be used to extend to additional regular receptacles beyond the GFCI. This allows them to also be protected by the ground-fault-circuit protection offered by the GFCI receptacle that feeds them. The advantage here is that GFCI receptacles are quite expensive compared to standard receptacles and using one to protect other standard outlets offers notable cost savings. But should the GFCI "trip," the downstream receptacles will also lose power under this wiring configuration. This section of the circuit, then, is an example of wiring in series, since the failure of the GFCI leads to failure of the receptacles located downstream.